The fossil fuel industry has spent many millions of dollars on confusing the public about climate change. But the role of vested interests in climate science denial is only half the picture. Interest in this topic has spiked with the latest revelation regarding coalmining company Peabody Energy. After Peabody filed for bankruptcy earlier this year, documentation became available revealing the scope of Peabody’s funding to third parties. The list of funding recipients includes trade associations, lobby groups and climate-contrarian scientists. This latest revelation is significant because in recent years, fossil fuel companies have become more careful to cover their tracks. An analysis by Robert Brulle found that from 2003 to 2010, organisations promoting climate misinformation received more than US$900 million of corporate funding per year. However, Brulle found that from 2008, open funding dropped while funding through untraceable donor networks such as Donors Trust (otherwise known as the “dark money ATM”) increased. This allowed corporations to fund climate science denial while hiding their support. The decrease in open funding of climate misinformation coincided with efforts to draw public attention to the corporate funding of climate science denial. A prominent example is Bob Ward, formerly of the UK Royal Society, who in 2006 challenged Exxon-Mobil to stop funding denialist organisations. John Cook interviews Bob Ward at COP21, Paris. The veils of secrecy have been temporarily lifted by the Peabody bankruptcy proceedings, revealing the extent of the company’s third-party payments, some of which went to fund climate misinformation. However, this is not the first revelation of fossil fuel funding of climate misinformation – nor is it the first case involving Peabody. 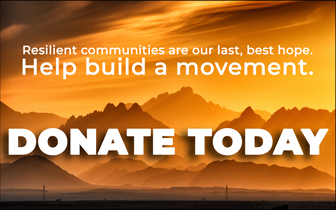 In 2015, Ben Stewart of Greenpeace posed as a consultant to fossil fuel companies and approached prominent climate denialists, offering to pay for reports promoting the benefits of fossil fuels. The denialists readily agreed to write fossil-fuel-friendly reports while hiding the funding source. One disclosed that he had been paid by Peabody to write contrarian research. He had also appeared as an expert witness and written newspaper op-eds. John Cook interviews Ben Stewart, Greenpeace at COP21, Paris. Peabody’s funding of climate change information and misinformation is one episode in a much larger history of fossil-fuel-funded misinformation. An analysis of more than 40,000 texts by contrarian sources found that organisations who received corporate funding published more climate misinformation, a trend that increased over time. 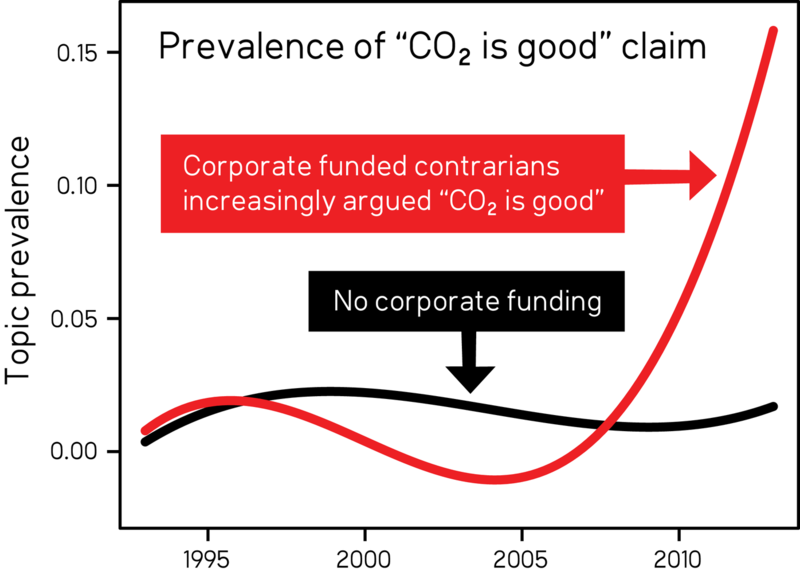 The following figure shows the use of the claim that “CO₂ is good” (a favourite argument of Peabody Energy) has increased dramatically among corporate-funded sources compared with unfunded ones. In 1991, Western Fuels Association combined with other groups representing fossil fuel interests to produce a series of misinformation campaigns. This included a video promoting the positive benefits of carbon dioxide, with hundreds of free copies sent to journalists and university libraries. The goal of the campaign was to “reposition global warming as theory (not fact)”, attempting to portray the impression of an active scientific debate about human-caused global warming. ExxonSecrets.org has been tracking fossil-fuel-funded misinformation campaigns for more than two decades – documenting more than A$30 million of funding from Exxon alone to denialist think tanks from 1998 to 2014. Exxon’s funding of climate science denial over this period is particularly egregious considering that it knew full well the risks from human-caused climate change. David Sassoon, founder of Pulitzer Prize-winning news organisation Inside Climate News led an investigation into Exxon’s internal research, discovering that its own scientists had warned the company of the harmful impacts of fossil fuel burning as long ago as the 1970s. John Cook interviews David Sassoon from Inside Climate News. Even Inside Climate News’s revelation of industry’s knowledge of the harmful effects of climate change before engaging in misinformation campaigns has precedence. In 2009, an internal report for the Global Climate Coalition, a group representing fossil fuel industry interests, was leaked to the press. It showed that the coalition’s own scientific experts had advised it in 1995 that “[t]he scientific basis for the Greenhouse Effect and the potential impact of human emissions of greenhouse gases such as CO₂ on climate is well established and cannot be denied”. Nevertheless, the organisation proceeded to deny climate science and promote the benefits of fossil fuel emissions. However, to focus solely on industry’s role in climate science denial misses half the picture. The other significant player is political ideology. At an individual level, numerous surveys (such as here, here and and here) have found that political ideology is the biggest predictor of climate science denial. Consequently, groups promoting political ideology that opposes market regulation have been prolific sources of misinformation about climate change. This productivity has been enabled by the many millions of dollars flowing from the fossil fuel industry. Naomi Oreskes, co-author of Merchants of Doubt, refers to this partnership between vested interests and ideological groups as an “unholy alliance”. To reduce the influence of climate science denial, we need to understand it. This requires awareness of both the role of political ideology and the support that ideological groups have received from vested interests. Without this understanding, it’s possible to make potentially inaccurate accusations such as climate denial being purely motivated by money, or that it is intentionally deceptive. Psychological research tells us that ideologically driven confirmation bias (misinformation) is almost indistinguishable from intentional deception (disinformation). Video from free online course Making Sense of Climate Science Denial (launches August 9). The fossil fuel industry has played a hugely damaging role in promoting misinformation about climate change. But without the broader picture including the role of political ideology, one can build an incomplete picture of climate science denial, leading to potentially counterproductive responses.